The Geological Survey of Northern Ireland (GSNI) has its own core store located on the shores of Belfast Lough, about 5 miles away from the main GSNI office. We are currently in the process of curating all of our historic core and whilst doing so we were contacted by a relative of the person who drilled these very cores and were fortunate enough to get the chance to examine their recent discovery of a family archive dating back to the 1950s. The GSNI core store contains around 20 km of rock core from boreholes across Northern Ireland and conserves cores and rock specimens as an archive for research, industry and educational use. A number of cores come from boreholes that were from 1949 to 1960 in a program of drilling carried out by GSNI shortly after the inception of the survey in 1947. The boreholes were mostly drilled in search of coal, gypsum/anhydrite or perlite in the areas around Stewartstown, Dungannon and Coalisland in Co. Tyrone, Newtownards in Co. Down and Ballycastle and Sandy Braes in Co. Antrim. right hand image shows the core in its new state. Some of the cores are only now seeing the light of day since being drilled and are being curated to preserve them and make them available for future research. Often when unpacking the core there are things that take us back to that era, wrappers from the food the drillers were eating, newspapers from the day they were packaged up or even unused WWII army billboard posters (see below), but we rarely have much more to link with the people who drilled the core. It came as a surprise then to receive a phone call that led to a chance to meet a relative of one of the men who drilled the boreholes. 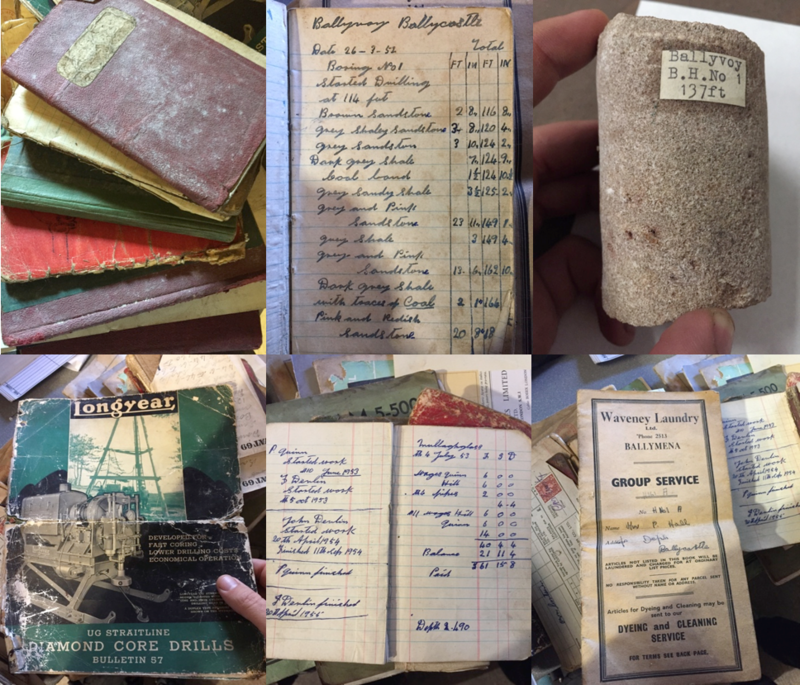 Sorting through old family documents him and his wife had found a number of old photographs, papers and notebooks detailing the meticulous work of life as a driller in the 50s. The driller was Patrick Hall of Ardrahan, Co. Galway who worked for Fahy of the Irish Diamond Drilling Co., based in Lucan, Dublin. The Government contracted them to drill the boreholes and Patrick Hall carried out the drilling of many boreholes for the survey during this time. was provided by the stationery office (right). Patrick Hall drilled 27 boreholes for the GSNI and from many of which core was recovered. And is still in the GSNI archive. Besides all these detailed notes, we were shown books detailing the wages paid to workers on the drill rig, expenditure on replacement parts and drilling muds, even receipts and costs for the laundry. Drilling is still a mucky job, although the drill rigs have improved somewhat. 1952. 4. Laundry price list. 5. Wage books for the drilling. 6. Manual for the diamond core drill. Some of the kit used in recovering core and even the manual for the drill rig itself was contained in the archive. Then we looked through the photographs that took us back to a bygone age of smartly dressed workers who took pride in what they did and the machinery that they operated. Patrick Hall operating the Longyear diamond core drill (left) and drillers posing for a phtograph on the drill site (right). The gentleman with the tie is possibly the district geologist (GSNI) Alexander Fowler. Patrick Hall is seen on the far right. The cores and the results of the drilling were pivotal in developing our understanding of the subsurface geology of Northern Ireland and have gone on to be used in a variety of geological publications. For more on GSNI's history and the role that drilling has played in our success then just click here. We would like to thank the relatives of Patrick Hall for taking the time to show us this material and allowing us to photograph the archive for use in this article. Rob Raine is a sedimentologist at the GSNI with responsibility for the curation and management of the GSNI core store. Kieran Parker is an environmental geologist with GSNI with responsibility for abandoned mines and geohazards.